Comet Hyakutake’s close pass by Earth in late March brought more than spectacular sky watching for backyard astronomers: it was the first time a comet was found to emit X-rays. Aiming the X-ray-detecting rosat satellite at Hyakutake, astronomers from nasa’s Goddard Space Flight Center and the Max Planck Institute for Extraterrestrial Physics in Germany spied a crescent-shaped glow extending some 30,000 miles in front of the coma, the thick layer of gas and sunlight-scattering dust streaming off the comet’s nucleus. When the German astronomers later reviewed data collected by rosat during an all-sky survey in 1990, they found four more comets that had produced X-rays. That tells us that Hyakutake was not a fluke, says Carey Lisse, leader of the Goddard team. All comets probably give off X- rays to some degree. 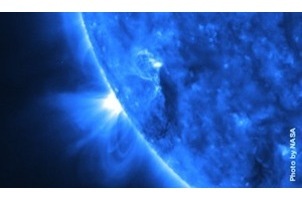 Astronomers aren’t sure how the X-rays are generated, but the energy must come from the sun. One possible source is the solar wind. Imagine highly charged particles streaming rapidly out from the sun and whacking into the comet, says Lisse. Another possibility is the sun’s magnetic field, which Hyakutake plowed through as it traversed the solar system. The idea is that the sun’s magnetic field could suddenly have changed, and that would cause the magnetic field and currents in the comet to change, Lisse explains. It’s like what happens when a lightning bolt hits and your circuit breaker trips. You’re suddenly driving current backward, and you get a power surge. We think that might be able to drive energy into X-rays. Think comets are cool? Tweet about them!